We all have seen it, but most aren’t sure what it’s used for. It’s popularity has grown through both Olympic and professional athletes. This colored tape athletes wear to enhance their performance is also available to all of us. 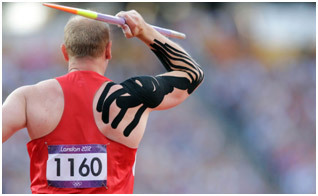 It’s called kinesio taping, spider tape, rock tape, etc. It’s a new method of supporting joints and muscles without sacrificing range of motion. This tape is applied by a certified professional to treat pain, edema, and also for preventative maintenance. This method basically stems from the science of Kinesiology; hence the name “Kinesio”. Muscles are not only attributed to the movements of the body but also control the circulation of venous and lymph flows, body temperature, etc. Therefore, the failure of the muscles to function properly induces various kinds of symptoms. Don’t know what to do for your Valentine this year? From now through February 14th, book a one hour massage for your sweetheart, and we’ll sweeten the deal! Stop in to either of our locations and purchase a gift card for a one hour massage to give as a gift to your loved one. Massage has many therapeutic benefits such as stress relief, lowering of blood pressure, and even provides pain relief! You will receive a free box of Waggoner Chocolates to present with your certificate! What better way is there to say “I love you!” than to give the gift of relaxation; except perhaps a little chocolate to go with it? Welcome to our brand new blog page! Last year, we completely revamped our entire website to provide our customers with better information about CCWC and the services we offer. We included bios on all of our doctors and staff, helpful resources to download so you can stay in good health, and links to organizations that we support through charitable giving! However, we also wanted a way in which to continue providing our patients with new information as well. This blog will be that outlet! We plan to provide you with interesting facts and news from the world of medicine, detailed information on promotions we are offering, and maybe a funny story or two to help lighten your day a little.